This year, with its Malian fish farm project nearly finalized, and barely over a month to go until implementation, the University of Pittsburgh chapter made the decision to scale back to another assessment trip. It was not easy, and emotions were high. So was the pressure to go ahead from some mentors. But the decision to play it safe was, in the mind of this author (who led the design), the right one. The design of the pond system had been partially based on a photograph showing an existing seasonal pond in the village. 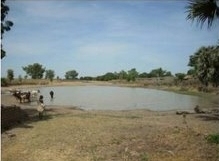 The design team was under the impression that this photograph showed the pond at its greatest extent during the rainy season. Based on this assumption, combined with rushed percolation tests during the initial assessment trip, the team decided that water loss through infiltration would be negligible. This led to a model that was very optimistic. After TAC review, however, one of the project’s mentors went back to the village while travelling in Western Africa. She sent back the news (and eventually we received pictures verifying this) that the seasonal pond was several times larger than expected when full. The original design was suddenly made no good, since it was realized that infiltration must be a much larger factor than originally expected. Nonetheless, at this point the village had already been informed that they would have a fish farm in May. In realizing this, the design team was faced with several options. On the one end, the design could simply be scaled up. This was technically impossible to build with the current schedule and budget. It also raised many safety issues. Construction could loosen the soil and result in even more infiltration. It could also reduce infiltration and result in flooding the village. Even if infiltration remained the same, it seemed unlikely that anything we did would have a real effect on how long water lasted in the pond throughout the year. On the other side of our list of options, the trip could be cancelled. This would be a disappointment to the village, but would avoid the huge risks associated with a rushed second design. This option would also result in forfeiting several large grants. Somewhere in between was the option of simply eliminating the construction portion of the trip, and using it to collect data that was still needed to finalize the design. This data should have been collected on the first site assessment, but wasn’t due to the fact that it was barely over a week long. The plan for this new assessment includes the installation of a rain gage and staff gage to measure rainfall and pond depth, as well as a survey to the extents of the watershed and better tests for infiltration. This plan was deemed the best, not only by the local chapter, but by nationals during a call updating them on the project. What can be learned from all this? First of all, assessment trips need to be much longer than a week to be effective. Time is taken up at the beginning and end of the trip simply to adjust to being in the village. Second, the risks to a community of a bad design are too high to base a project on assumptions made on a different continent. The photograph should not have been used without being sure of when it was taken, and what it showed. The original assessment was during the dry season, and the photograph was not taken by the U. Pitt team. More questions should have been asked. Site assessments are vital to successful design, and should be treated as such. They should be long enough, and if not enough is learned the first time to go ahead without a doubt, there should be a second trip. Things worked out this time, but they could have gone much differently.